Whoever heard of Vegetable Offal? It’s because I’d enjoyed last year’s Symposium so much that I was disappointed to hear that the 2016 theme was ‘offal’. I won’t be able to come then, I said, I’m vegetarian so it’ll be of no use to me. But there’s vegetable offal: discarded bits of fruit and veg such as the peel, seeds and stems, said Bee Wilson, Diana Henry and about half a dozen others. Vegetable offal, I laughed. They’re just being polite, or it’s just a ruse to get more people to attend, I thought. Whoever heard of vegetable offal? No other meeting is quite like the Oxford Food Symposium. It’s unique for the varied origins, backgrounds and skills of participants who come together from all over the world for three days in Oxford during which food cultures meet and specialisms interact. Sally Grainger taking part in a reconstruction at Butser Ancient Farm near Petersfield, Hampshire. Sally Grainger began her career as a real hands-on pastry chef. With that background she has now become one of the better-known hands-on food historians. After a decade working as a chef she took up Classical Studies as an undergraduate at Royal Holloway College, and, while doing so, held her first reconstructed Roman banquet (a farewell to Professor Martin West, who was moving to All Souls’, Oxford). In 1996 she and Andrew Dalby wrote The Classical Cookbook, an enduring success, for British Museum Press. The recipes, as authentic as could possibly be achieved, were Sally’s. Anthony Buccini enjoying a glass of Old Rosie scrumpy at the Turf Tavern in Oxford. Ken has been a regular symposiast since 1997. Hear him speak at Oxford and meanwhile visit his blog, Ken Albala’s Food Rant, http://www.kenalbala.blogspot.com/ in which he claims to live at Stockfish, California … Believe this or believe it not, Ken was evidently fated to get trapped in the interface between words and food. One of his early books, The Banquet, surprises the reader with a series of tasty neologisms a few of which were convincing enough to escape his copy-editor’s keen eyes. Next time you encounter the word ‘apastasy’ (refusal to eat pasta) remember that Ken invented it. We are delighted to introduce María José Sevilla of Food and Wines from Spain, a loyal sponsor of the Oxford Symposium over many years. Please tell us a bit about yourself, your background in food, and your current role at Food and Wines from Spain? In the Spain where I grew up in the 1950s food was regional and very tasty. The years of hunger brought by the Civil War had been left behind and food production and distribution had reached some form of normality. My father was a demanding eater and my mother a good cook. She knew how to please him at the table as much as she knew how to please my brother and me. It was easy for her as she had learned to cook from her own mother, a professional cook and so I learned from both. I cook now as they did: rice and pasta, pulses, more fish than meat, plenty of fresh vegetables and a few puddings such as apple, brioche with caramel tart and cream caramel. In November we had pomegranate with sugar and strawberries and wine in the spring. We often cooked with fruit or served it fresh especially in the summer when the whole house used to smell as my house in Spain smells now in June and July with peaches, apricots, cherries, light and dark green figs. 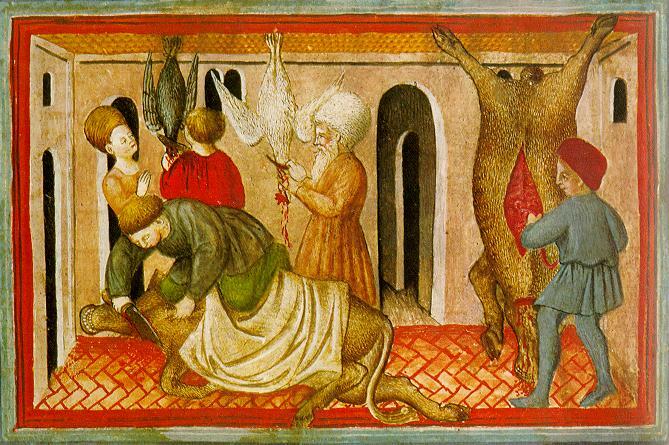 A 15th-century depiction of shechita and bedikah. The Symposium’s President, Claudia Roden, shares a recipe for brain fritters and considers the place of offal in Sephardic communities. These delicate fritters, crisp outside and deliciously soft and creamy inside are popular throughout the Sephardi world. Scenes from Borough Market and local charity groups collecting donated produce from the market. We are delighted to introduce Borough Market who are co-sponsoring the Saturday lunch at the Symposium with the Oxford Food Bank. In this post David Matchett, the Market Development Manager, explores the role of offal at Borough Market. Here at Borough Market, we love a bit of offal. Browse our butchery stalls and you’ll find them packed with livers and lights, hearts and heads. Partly, this is because our shoppers tend to be pretty serious about cooking and eating, and there’s nothing they enjoy more than the earthy joys of good offal. But the presence here of lots of undervalued cuts of meat is more than a matter of taste — it is an essential part of our philosophy. We are delighted to introduce the Oxford Food Bank who are co-sponsoring the Saturday lunch at the Symposium with Borough Market. Hi, my name is Liz Buckle and I work as a volunteer at the Oxford Food Bank, I’ve been doing this for about a year since I ‘retired’ from a job with the Environment Agency – England’s environmental regulator. I don’t have a background in food but I do like to eat fresh, good quality food and feel that this is a basic necessity for everyone. My environmental background and experience means that I’m passionate about the need to reduce waste and that includes food waste. I’m also a really keen gardener and allotment holder so love being able to pick and eat fresh fruit and veg and eat it within hours. I’m one of around 100 volunteers at the Food Bank and I drive or go out in vans to either collect fresh food from suppliers or to give food to charities.